The tourism industry thrives on imagery, which is why a travel company’s website should have two goals. One is to get customers to visualize themselves in your destinations by providing great images and information. The other is to provide a complete and easy platform for customers to sign up and pay for their travel. You can accomplish both goals by building your website using WordPress, which has several pre-existing travel website themes. 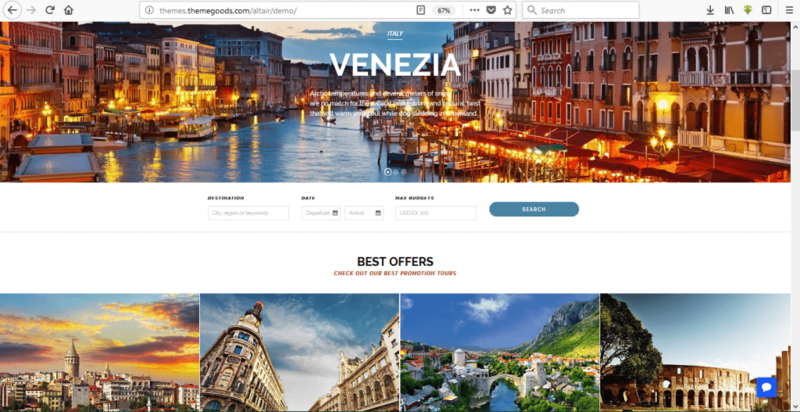 In this article, we narrowed down the highest ranking WordPress travel themes, both free and paid, as reviewed by users. We’ve specifically chosen website themes that are responsive, highly customizable, content focused, and optimized for speed so you can concentrate more on your content and less on the design. A WordPress website can fit any travel business’ budget. Using Bluehost, you can get a website, domain, business email, and hosting for less than $3 per month. You can try a live demo of Zillah here and download it here. 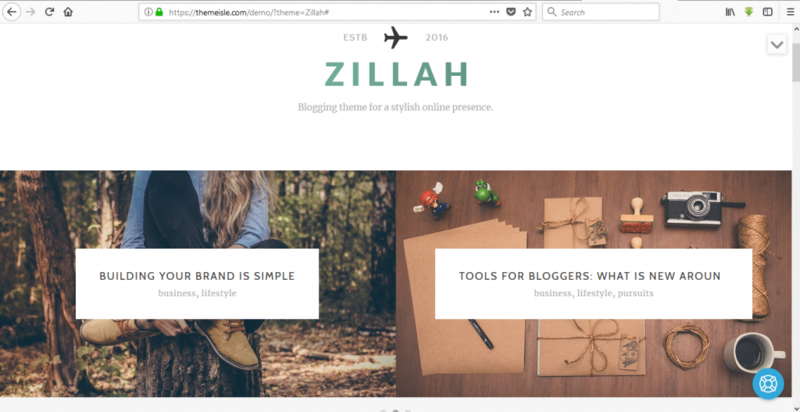 Zillah is a clean and modern theme designed for multiple purposes, but it looks great for featuring a travel blog on your website. Zillah gives you full control over the design and structure of your menu, and it’s responsive and user-friendly. It’s important to have a mobile responsive travel website as over one quarter of customers book travel through a mobile device. It also offers real time fine tuning of your website, making it easier to see the effects of changes in colors, design details, section ordering, and other elements. What we love about Zilla: You usually have to add more scripts if you want to use more than a single image as your background, but with Zillah, you can customize backgrounds with videos and media sliders without requiring additional plugins. This theme is also built with a Search Engine Optimization (SEO)-ready structure to help customers easily find your website on search engines, and elements can even be translated to other languages using free and premium plugins. You can try a live demo of Newspaper X here and download it here. Newspaper X is a theme that gives a travel magazine feel to your website. Developed using Bootstrap, the clean and minimalist design will draw your visitors’ attention to your content while looking great in any mobile device. 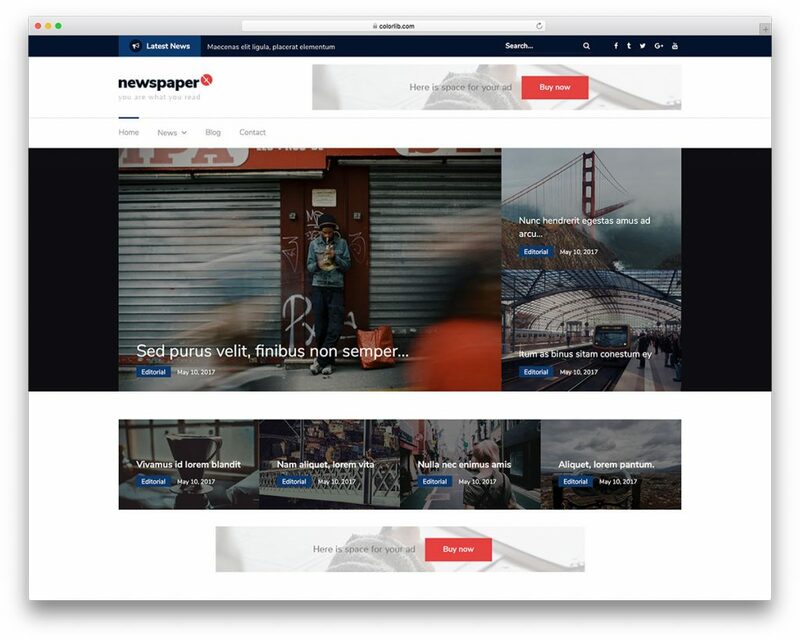 What we love about Newspaper X: This theme comes supported with important website plugins like WooCommerce for selling your products and providing payment options, and Yoast SEO to improve your website’s searchability. It’s also retina ready and displays razor sharp text to give users more out of their mobile experience. You can try a live demo of Courtyard here and download it here. Courtyard WordPress theme is the perfect theme for hotel and resort websites with a clean, minimalist design. The landing space is adaptable and easily customizable, giving you tons of possibilities for your layout. This theme also includes a full width page slider, giving your customers a better browsing experience. What we love about Courtyard: Some travel websites needs space to sell souvenirs online and Courtyard is designed to do just that with WooCommerce to help you design shop and product pages that are easy to setup. 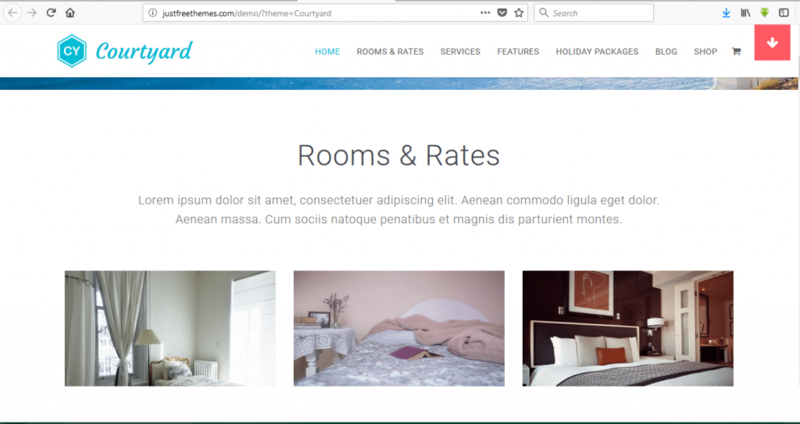 This theme is pre-loaded with really helpful widgets like room slider, testimonial, and logo widgets to help you with converting website visits into bookings. You can try a live demo of Virtue here and download it here. One of the best features of Virtue is having Schema microdata integrated in its build to give your site an advantage in SEO ranking. It’s also fully customizable, giving users full control over changes in the homepage layout, sliders, and fonts. You can completely customize your look without writing any code. 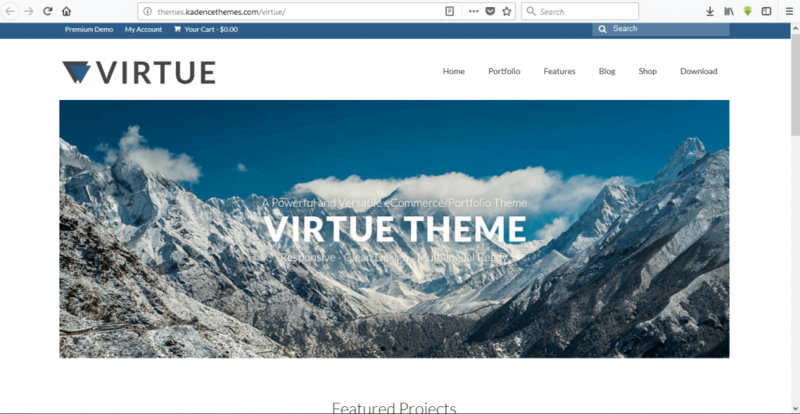 What we love about Virtue: This theme is extremely versatile and fully WooCommerce ready. If that’s not enough, you can get a head start on your website with the Kadence Demo Importer, giving you access to all the content and images in the demo. Usually, when you buy a WordPress theme, it doesn’t come with the photos and other graphics that you see in the demo. Kadence lets them download them and use them as your own images. You can try a live demo of Snowbird here and download it here. Snowbird is every blogger’s and content maker’s dream theme. It gives you a number of layout options for single and multiple entry posts and customization options on almost every component. Not only does it highlight clear and sharp images for your destinations, but it also uses beautifully crafted typography, which makes the presentation of your website easy to adapt on all devices. What we love about Snowbird: Whether you’re a WordPress expert, or a complete novice, this theme is wonderfully user friendly. It offers “child theme supports” that are recommended as a starting point for your project, making it easy to extend your design as you learn. You can try a live demo of OceanWP here and download it here. OceanWP is one of the top choices for travel bloggers and hobby websites because of its versatility. Developers particularly love its flexible codebase that makes it easy to customize. This WordPress theme is free to download while offering key features you would expect from premium websites to give you that elegant, professional look no matter how you personalize it. What we love about OceanWP: Current users could not cease raving about the fantastic, almost-instant, customer support that the author of OceanWP provides. Customers using this theme recommend purchasing the premium extension bundle which allows you to do even more customization. You can try a live demo of Travel Eye here and download it here. Travel Eye offers a range of customization options to help you create the perfect travel website design that matches your brand. It provides premium quality features such as the Customizer API that lets you personalize the look and feel of your website from the theme options, layouts, and fonts. You can also choose to apply the pre-built homepage layout to get your site quickly set up and ready to go. What we love about Travel Eye: This theme uses a drag-and-drop feature powered by Page Builder that makes it very easy to customize. If you want something even more simple, you can try its pre-built homepage layout to get you started quickly and personalize it as you learn how to use the platform. You can try a live demo of Amadeus here and download it here. 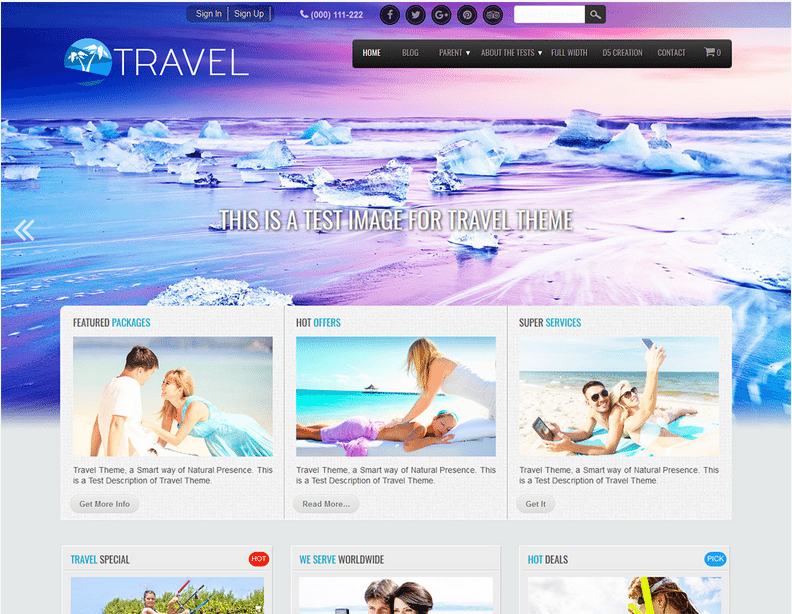 Travel WordPress theme is sophisticated, lightweight, and highly adaptable with its user-friendly theme options. It gives users a high level of control over all aspects of the website from the sidebars to the footers, and a range of color schemes that will help you adjust the theme to match your brand. Create your blog, set up shop and feature albums of your destinations easily with powerful plugins. What we love about Travel: In the Travel WordPress theme, simple design and elegance go hand in hand. It’s got several customization options but the simple ones are the most popular among its users. The theme’s admin options dashboard called Travel Options is also easy to work with, even for beginners, making web design an enjoyable experience. You can try a live demo of Illdy here and download it here. If you’re looking for a sleek and stylish, one page landing style layout It for your website, check out Colorlib’s Illdy website theme. Its one page setup with multiple sections can be tweaked to achieve the personalization you’ve always wanted. Aside from offering premium features, Illdy is designed to support most of the free and premium plugins, like Contact Form 7 and WordPress SEO plugin to help bring the best out of your website. What we love about Illdy: This WordPress theme has an amazing full screen hero image design (the image that visitors first see when they visit your website) that will surely make your most important content stand out. If you want to feature or promote a certain product or service for your travel and tours business, the hero image is a great call to action platform. You can try a live demo of Travelify here and download it here. 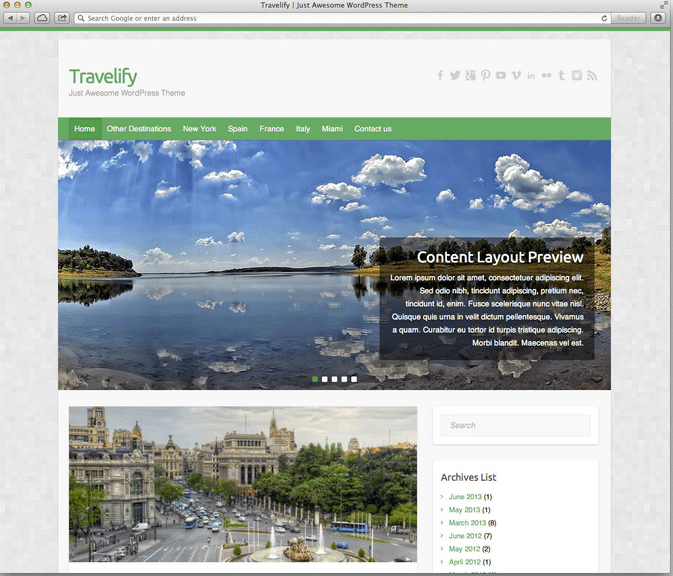 Travelify is a free, responsive WordPress theme that was built with travel, adventures, languages and nature in mind. It has a stunning razor sharp display that makes everything from your images to your text stand out on any device. It comes with support for popular WordPress plugins as well as WooCommerce to give your customers a sleek and easy online booking experience. What we love about Travelify: This theme makes customization a quick and easy task with its built-in options. If you like attention to detail, you will definitely appreciate the control this theme provides over your logo, social links, webclip icon, favicon, webmaster tools, and other awesome features. You can try a live demo of Altair here and purchase it here. Altair is an elegant premium WordPress theme specially designed for creating travel agency, tour guide, or booking websites. You’d never guess that this website theme can be personalized for your business in minutes, thanks to the drag-and-drop content builder that makes custom layout designs so easy. Altair has all the amenities you would ever need for your travel booking website. What we love about Altair: The advanced theme panel compatible for WordPress gives you the freedom to customize your website down to the last detail. And if you feel that you’re getting way over your head with all the design options, ThemeGoods provides friendly and efficient customer support that’s always ready to help. You can also install the demo content and still get that elegant look and feel that your customers will surely love. You can try a live demo of TheCore here and purchase it here. TheCore is a stunning WordPress theme specifically built for travel firms and agencies. It features a modern, elegant design that will draw your customers in right away. The theme comes with an advanced visual page builder, revolution and layers sliders, as well as a WooCommerce compatible design to give your customers the full service that any travel website should provide. What we love about TheCore: Not a fan of the dark color scheme? TheCore provides you with an unlimited color scheme to choose from. Change it up, and add your own images to bring the theme more to your liking. You can try a live demo of Magellan here and purchase it here. 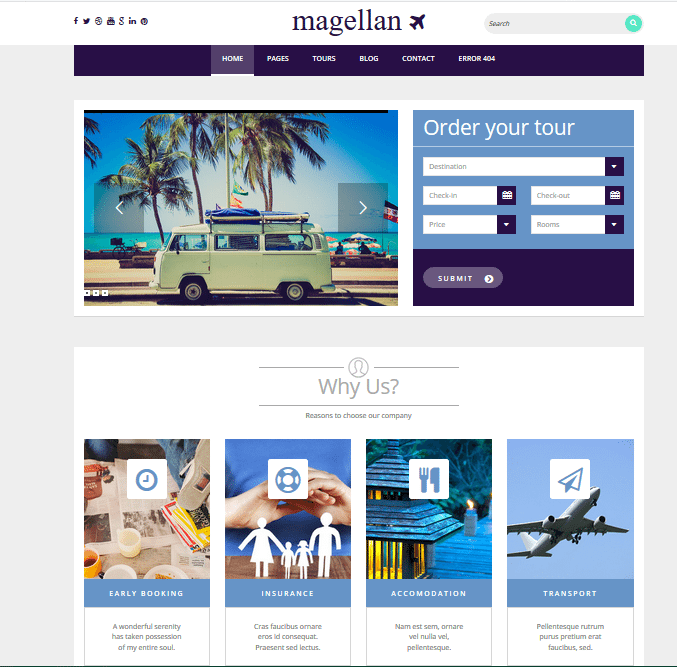 Magellan is an all around user-friendly WordPress theme with a full range of components and features to power your travel related website. It comes packed with working order forms, custom posts for your tour pages, and clear beautiful images that will certainly impress. Customization is a breeze with its powerful frame and administration tool that makes it easy to customize the look and feel of your theme even without advanced web development training. 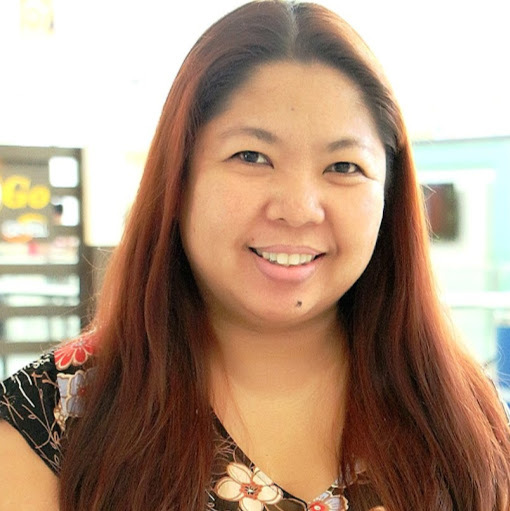 What we love about Magellan: Be it for a travel blog, tour operation, travel agency, or booking site, Magellan brings about an upbeat, engaging vibe that your visitors surely won’t miss. Along with its user friendly format, this WordPress theme is bound to get you customers all year round. You can try a live demo of Brilliance here and purchase it here. Brilliance is a responsive theme that offers a clean, minimalist design that will look great on all devices. It was built with a travel business’ success in mind, equipping the user with all the tools needed to build a high-converting website. It can support WooCommerce, Easy Digital Downloads, Contact Form 7, Yoast SEO, and other popular WordPress plugins. The theme also features 5 sidebar layouts to choose from for better customization. What we love about Brilliance: The custom shortcodes on this theme allows you to improve the interactive experience on your website. The design element options available for you, such as buttons, accordions, and pricing tables will surely keep your visitors interested. You can try a live demo of Bellevue here and purchase it here. The Bellevue WordPress theme is both functional and elegant and will inspire any user’s creativity in making the layouts reflect their brand. The Bellevue offers a variety of layouts you can use depending on the type of travel business you have. Availability Calendars, a plugin that provides a simple online booking process, and secure payment via WooCommerce will help improve conversion rates on your website. What we love about Bellevue: This theme has it all. They have layouts for different types of travel related businesses, such as hotels, bed & breakfasts, and even country cottage retreats. Be sure to check out the demos they have for each, and choose one that works best for your site. You can try a live demo of CheerUp here and purchase it here. 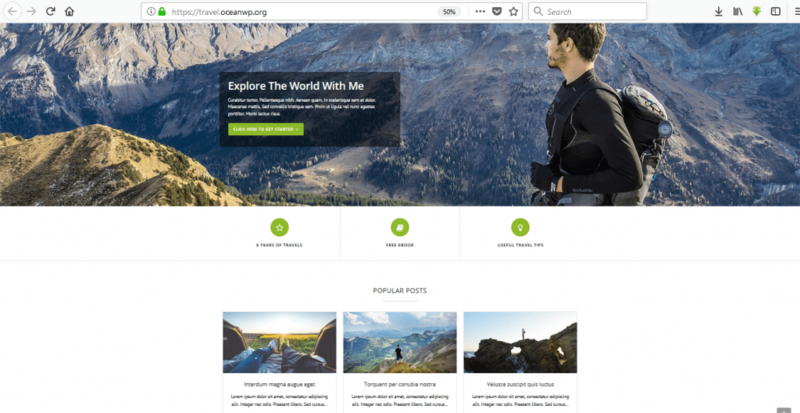 CheerUp is a WordPress theme perfect for travel blogs with a layout that effectively features your content without distraction in an elegant design. It was built with state of the art HTML5 technology to give your site a modern design and solid visual performance across devices. It also uses advanced graphical effects such as Parallax Backgrounds, Headers, and Video Background pages that will surely inspire anyone’s creativity. What we love about CheerUp: CheerUp’s variety of gallery options is really impressive. Aside from the ones you get from Jetpack galleries, like square, rounded, mosaic and tiled format, they have also designed their own to help your images stand out even more. If you get stuck with all the customization options, they have great dedicated customer support to help you out. Email and chat support are included in the cost. You can try a live demo of Journey here and purchase it here. Journey WordPress theme was built specifically for travel related websites. It comes in a unique magazine design to give blogs a much needed upgrade from the regular blog layouts. It is also packed with a variety of category and page template options that you can mix and match to give you control on the look and feel of your website. What we love about Journey: If you want more than just a standard travel blog for your business, then this theme is for you. Showcase high quality images of your top travel destinations, including image sliders, to make managing videos and photos a simple task. You can try a live demo of Etalon here and purchase it here. 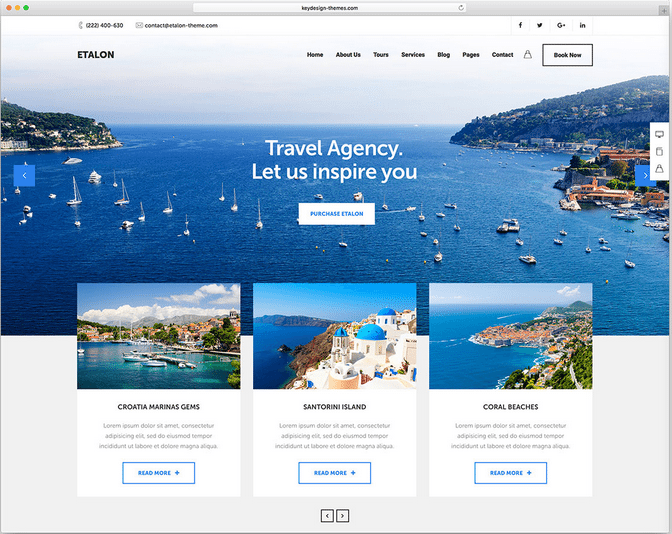 Etalon is an adaptable WordPress theme that’s great for all kinds of businesses but is perfect for travel agencies. It’s easily customizable, letting you decide how you want to share your images and your videos with simple drag-and-drop actions. It also includes a pricing table short-code to help you present your available tours and travel in the style and form that you want. What we love about Etalon: Enjoy exploring more than 35 custom made elements just for Etalon users. You can easily create countdown timers for special events (e.g. a vacation giveaway), attract your visitors with animated counters, or add responsive Google maps on your website in a few simple steps. You can try a live demo of Book Your Travel here and purchase it here. Book Your Travel is one of the popular WordPress travel themes dedicated for businesses in the tourism niche. It features a powerful and completely integrated booking system, availability checker, advanced search filtering, front-end management for partners, a review system, and much more. Its layout is highly customizable without ever requiring coding skills from its users. You don’t have to worry about messing up because the theme is well documented and backed by responsive customer support that existing users love. What we love about Book Your Travel: To cater to anxious first time travelers or very particular frequent travelers, use this theme’s in-depth booking customization. You can configure your booking segments to the most minute detail using a dozen configurations available like tour types, multiple pricing options, custom queries, location information, and even reviews from existing clients. Book Your Travel’s booking system is also integrated with WooCommerce which allows you to use 105 payment gateways to charge for bookings. You can try a live demo of Travel WP here and purchase it here. Travel WP is a WordPress theme developed for travel agencies and tour operators of any size because it offers a lot of flexibility and possibilities in setting up tours. You can indicate as many tour attributes as you like. These attributes can later be used for setting up a search form. What we love about Travel WP: Feedback is essential to building a travel brand, which is why having a space for customer feedback on your website should be priority. Travel WP includes two options for displaying feedback and you can either let anyone leave a review of their experience by going back to the page through which they booked the tour. Or, you can add a custom feedback widget on your Travel WP site to encourage clients to voice their experience on a custom feedback page. This helps visitors to your website reach a decision to purchase your services. There are so many tourism wordpress themes online, and your design and layout will have to impress in order to stand out from the crowd. With your creativity and this list of free and paid WordPress themes for travel sites, your business should be well on its way to success. 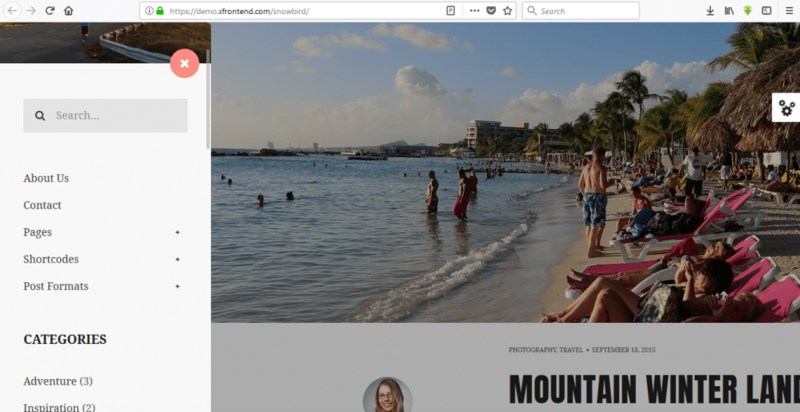 Did we miss out on your favorite WordPress travel theme? Let us know in the comments below.